We all enjoy the pre-game hype, anticipate a round of fabulous television commercials and look forward to seeing what the Clydesdales will do next. As the public prepares for the big game, doctors and nurses in hospital emergency rooms prepare for something else -- a potential rush of heart attack patients. It's an annual event. We all enjoy the pre-game hype, anticipate a round of fabulous television commercials and look forward to seeing what the Clydesdales will do next. As the public prepares for the big game, doctors and nurses in hospital emergency rooms prepare for something else -- a potential rush of heart attack patients. While doctors have long known that emotional stress can cause a heart attack, Los Angeles cardiologist Robert Kloner was the first to link the Super Bowl to heart risk. Focusing on death rates in Los Angeles County, Kloner examined the health impact of two Super Bowl appearances by Los Angeles teams. In 1980, the LA Rams lost a tight Super Bowl game to the Pittsburgh Steelers. The game was local (played at the Rose Bowl) and very close during the first three quarters, increasing the emotional stress for Los Angeles fans. The Rams' loss had far reaching consequences, as the risk of death from cardiovascular causes in Los Angeles rose by 22 percent and stayed elevated for two weeks. The 1984 Super Bowl had a different outcome. That year, the Los Angeles Raiders easily beat the Washington Redskins by a score of 38 to nine. Doing the same calculations, Kloner found that the win was actually associated with a lower risk of death in Los Angeles over the next two weeks. In these two instances, the home team's performance had important implications for fans. 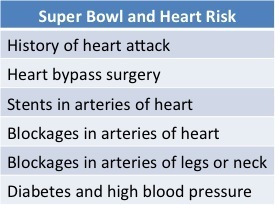 How could watching the Super Bowl cause a heart attack and other heart problems? Many people think the culprit is the combination of salty chips, high-fat dips and free-flowing alcohol? While these foods won't improve your health, they don't precipitate heart attacks on Super Bowl Sunday. The real cause is intense emotion. Emotional stress -- whether excitement or anguish -- activates your body's "fight or flight" response. Adrenaline and other hormones spike in the blood, causing increased heart rate and blood pressure. These physiologic changes tax the cardiovascular system and can lead to heart attacks and strokes. Most of us can watch the Super Bowl without fear of heart problems -- although we all have to manage our emotions as we worry about our favorite team's outcome. The danger applies only to those with pre-existing cardiovascular disease, specifically, those with blockages in the arteries of the heart. In addition, people with multiple risk factors for the blockages of coronary heart disease should be careful. If you have any of the conditions listed in the table, you need to take precautions to ensure a safe Super Bowl Sunday. You can watch the game. But stay calm. If you feel excessive stress and recognize that you are getting worked up, leave the room and go for a walk. Breathe deeply. Return to the game only when you have calmed down. If you actually develop chest pain or shortness of breath during the game, you may be having a heart attack. Call 911 immediately and then chew an aspirin while you are waiting for the ambulance. Use these tips to ensure that you are around to see many Super Bowls to come.